First Coastal designs, secures permits and constructs bay side stone revetment. 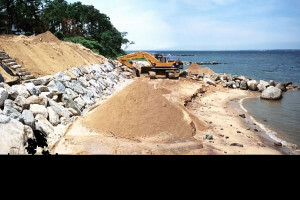 First Coastal’s Stone Revetment projects provide positive protection for severely eroded bay shorelines through the installation of professionally designed and built structures. A Stone Revetment is built to rigorous design standards to provide protection from direct wave impact. Scouring and adverse impacts to surrounding areas are mitigated through First Coastal’s design process. Our design promotes thriving tidal wetlands while providing unsurpassed protection. The diagram at the lower right demonstrates a typical Bay Stone Revetment cross section.